Modern chemistry keeps insects from ravaging crops, lifts stains from carpets, and saves lives. But the ubiquity of chemicals is taking a toll. Many of the compounds absorbed by the body stay there for years—and fears about their health effects are growing. My journalist-as-guinea-pig experiment is taking a disturbing turn. A Swedish chemist is on the phone, talking about flame retardants, chemicals added for safety to just about any product that can burn. Found in mattresses, carpets, the plastic casing of televisions, electronic circuit boards, and automobiles, flame retardants save hundreds of lives a year in the United States alone. These, however, are where they should not be: inside my body. Åke Bergman of Stockholm University tells me he has received the results of a chemical analysis of my blood, which measured levels of flame-retarding compounds called polybrominated diphenyl ethers. In mice and rats, high doses of PBDEs interfere with thyroid function, cause reproductive and neurological problems, and hamper neurological development. Little is known about their impact on human health. "I hope you are not nervous, but this concentration is very high," Bergman says with a light Swedish accent. My blood level of one particularly toxic PBDE, found primarily in U.S.-made products, is 10 times the average found in a small study of U.S. residents and more than 200 times the average in Sweden. The news about another PBDE variant—also toxic to animals—is nearly as bad. My levels would be high even if I were a worker in a factory making the stuff, Bergman says. In fact I'm a writer engaged in a journey of chemical self-discovery. Last fall I had myself tested for 320 chemicals I might have picked up from food, drink, the air I breathe, and the products that touch my skin—my own secret stash of compounds acquired by merely living. It includes older chemicals that I might have been exposed to decades ago, such as DDT and PCBs; pollutants like lead, mercury, and dioxins; newer pesticides and plastic ingredients; and the near-miraculous compounds that lurk just beneath the surface of modern life, making shampoos fragrant, pans nonstick, and fabrics water-resistant and fire-safe. The tests are too expensive for most individuals—National Geographic paid for mine, which would normally cost around $15,000—and only a few labs have the technical expertise to detect the trace amounts involved. I ran the tests to learn what substances build up in a typical American over a lifetime, and where they might come from. I was also searching for a way to think about risks, benefits, and uncertainty—the complex trade-offs embodied in the chemical "body burden" that swirls around inside all of us. Now I'm learning more than I really want to know. Bergman wants to get to the bottom of my flame-retardant mystery. Have I recently bought new furniture or rugs? No. Do I spend a lot of time around computer monitors? No, I use a titanium laptop. Do I live near a factory making flame retardants? Nope, the closest one is over a thousand miles (1,600 kilometers) away. Then I come up with an idea. "What about airplanes?" I ask. "Yah," he says, "do you fly a lot?" "I flew almost 200,000 miles (300,000 kilometers) last year," I say. In fact, as I spoke to Bergman, I was sitting in an airport waiting for a flight from my hometown of San Francisco to London. "Interesting," Bergman says, telling me that he has long been curious about PBDE exposure inside airplanes, whose plastic and fabric interiors are drenched in flame retardants to meet safety standards set by the Federal Aviation Administration and its counterparts overseas. "I have been wanting to apply for a grant to test pilots and flight attendants for PBDEs," Bergman says as I hear my flight announced overhead. But for now the airplane connection is only a hypothesis. Where I picked up this chemical that I had not even heard of until a few weeks ago remains a mystery. And there's the bigger question: How worried should I be? The same can be asked of other chemicals I've absorbed from air, water, the nonstick pan I used to scramble my eggs this morning, my faintly scented shampoo, the sleek curve of my cell phone. I'm healthy, and as far as I know have no symptoms associated with chemical exposure. In large doses, some of these substances, from mercury to PCBs and dioxins, the notorious contaminants in Agent Orange, have horrific effects. But many toxicologists—and not just those who have ties to the chemical industry—insist that the minuscule smidgens of chemicals inside us are mostly nothing to worry about. "In toxicology, dose is everything," says Karl Rozman, a toxicologist at the University of Kansas Medical Center, "and these doses are too low to be dangerous." One part per billion (ppb), a standard unit for measuring most chemicals inside us, is like putting half a teaspoon (two milliliters) of red dye into an Olympic-size swimming pool. What's more, some of the most feared substances, such as mercury, dissipate within days or weeks—or would if we weren't constantly re-exposed. Yet even though many health statistics have been improving over the past few decades, a few illnesses are rising mysteriously. From the early 1980s through the late 1990s, autism increased tenfold; from the early 1970s through the mid-1990s, one type of leukemia was up 62 percent, male birth defects doubled, and childhood brain cancer was up 40 percent. Some experts suspect a link to the man-made chemicals that pervade our food, water, and air. There's little firm evidence. But over the years, one chemical after another that was thought to be harmless turned out otherwise once the facts were in. The classic example is lead. In 1971 the U.S. Surgeon General declared that lead levels of 40 micrograms per deciliter of blood were safe. It's now known that any detectable lead can cause neurological damage in children, shaving off IQ points. From DDT to PCBs, the chemical industry has released compounds first and discovered damaging health effects later. Regulators have often allowed a standard of innocent until proven guilty in what Leo Trasande, a pediatrician and environmental health specialist at Mount Sinai Hospital in New York City, calls "an uncontrolled experiment on America's children." Each year the U.S. Environmental Protection Agency (EPA) reviews an average of 1,700 new compounds that industry is seeking to introduce. Yet the 1976 Toxic Substances Control Act requires that they be tested for any ill effects before approval only if evidence of potential harm exists—which is seldom the case for new chemicals. The agency approves about 90 percent of the new compounds without restrictions. Only a quarter of the 82,000 chemicals in use in the U.S. have ever been tested for toxicity. Studies by the Environmental Working Group, an environmental advocacy organization that helped pioneer the concept of a "body burden" of toxic chemicals, had found hundreds of chemical traces in the bodies of volunteers. But until recently, no one had even measured average levels of exposure among large numbers of Americans. No regulations required it, the tests are expensive, and technology sensitive enough to measure the tiniest levels didn't exist. Last year the Centers for Disease Control and Prevention (CDC) took a step toward closing that gap when it released data on 148 substances, from DDT and other pesticides to metals, PCBs, and plastic ingredients, measured in the blood and urine of several thousand people. The study said little about health impacts on the people tested or how they might have encountered the chemicals. "The good news is that we are getting real data about exposure levels," says James Pirkle, the study's lead author. "This gives us a place to start." I began my own chemical journey on an October morning at the Mount Sinai Hospital in New York City, where I gave urine and had blood drawn under the supervision of Leo Trasande. Trasande specializes in childhood exposures to mercury and other brain toxins. He had agreed to be one of several expert advisers on this project, which began as a Sinai phlebotomist extracted 14 vials of blood—so much that at vial 12 I felt woozy and went into a cold sweat. At vial 13 Trasande grabbed smelling salts, which hit my nostrils like a whiff of fire and allowed me to finish. From New York my samples were shipped to Axys Analytical Services on Vancouver Island in Canada, one of a handful of state-of-the-art labs specializing in subtle chemical detection, analyzing everything from eagle eggs to human tissue for researchers and government agencies. A few weeks later, I followed my samples to Canada to see how Axys teased out the tiny loads of compounds inside me. I watched the specimens go through multiple stages of processing, which slowly separated sets of target chemicals from the thousands of other compounds, natural and unnatural, in my blood and urine. The extracts then went into a high-tech clean room containing mass spectrometers, sleek, freezer-size devices that work by flinging the components of a sample through a vacuum, down a long tube. Along the way, a magnetic field deflects the molecules, with lighter molecules swerving the most. The exact amount of deflection indicates each molecule's size and identity. A few weeks later, Axys sent me my results—a grid of numbers in parts per billion or trillion—and I set out to learn, as best I could, where those toxic traces came from. Some of them date back to my time in the womb, when my mother downloaded part of her own chemical burden through the placenta and the umbilical cord. More came after I was born, in her breast milk. Once weaned, I began collecting my own chemicals as I grew up in northeastern Kansas, a few miles outside Kansas City. There I spent countless hot, muggy summer days playing in a dump near the Kansas River. Situated on a high limestone bluff above the fast brown water lined by cottonwoods and railroad tracks, the dump was a mother lode of old bottles, broken machines, steering wheels, and other items only boys can fully appreciate. This was the late 1960s, and my friends and I had no way of knowing that this dump would later be declared an EPA superfund site, on the National Priority List for hazardous places. It turned out that for years, companies and individuals in this corner of Johnson County had dumped thousands of pounds of material contaminated with toxic chemicals here. "It was started as a landfill before there were any rules and regulations on how landfills were done," says Denise Jordan-Izaguirre, the regional representative for the federal Agency for Toxic Substances and Disease Registry. "There were metal tailings and heavy metals dumped in there. It was unfenced, unrestricted, so kids had access to it." Now capped, sealed, and closely monitored, the dump, called the Doepke-Holliday Site, also happens to be half a mile upriver from a county water intake that supplied drinking water for my family and 45,000 other households. "From what we can gather, there were contaminants going into the river," says Shelley Brodie, the EPA Remedial Project Manager for Doepke. In the 1960s, the county treated water drawn from the river, but not for all contaminants. Drinking water also came from 21 wells that tapped the aquifer near Doepke. When I was a boy, my corner of Kansas was filthy, and the dump wasn't the only source of toxins. Industry lined the river a few miles away—factories making cars, soap, and fertilizers and other agricultural chemicals—and a power plant belched fumes. When we drove past the plants toward downtown Kansas City, we plunged into a noxious cloud that engulfed the car with smoke and an awful chemical stench. Flames rose from fertilizer plant stacks, burning off mustard-yellow plumes of sodium, and animal waste poured into the river. In the nearby farmland, trucks and crop dusters sprayed DDT and other pesticides in great, puffy clouds that we kids sometimes rode our bikes through, holding our breath and feeling very brave. Today the air is clear, and the river free of effluents—a visible testament to the success of the U.S. environmental cleanup, spurred by the Clean Air and Clean Water Acts of the 1970s. But my Axys test results read like a chemical diary from 40 years ago. My blood contains traces of several chemicals now banned or restricted, including DDT (in the form of DDE, one of its breakdown products) and other pesticides such as the termite-killers chlordane and heptachlor. The levels are about what you would expect decades after exposure, says Rozman, the toxicologist at the University of Kansas Medical Center. My childhood playing in the dump, drinking the water, and breathing the polluted air could also explain some of the lead and dioxins in my blood, he says. I went to college at a place and time that put me at the height of exposure for another set of substances found inside me—PCBs, once used as electrical insulators and heat-exchange fluids in transformers and other products. PCBs can lurk in the soil anywhere there's a dump or an old factory. But some of the largest releases took place along New York's Hudson River from the 1940s to the 1970s, when General Electric used PCBs at factories in the towns of Hudson Falls and Fort Edward. About 140 miles (225 kilometers) downstream is the city of Poughkeepsie, where I attended Vassar College in the late 1970s. PCBs, oily liquids or solids, can persist in the environment for decades. In animals, they impair liver function, raise blood lipids, and cause cancers. 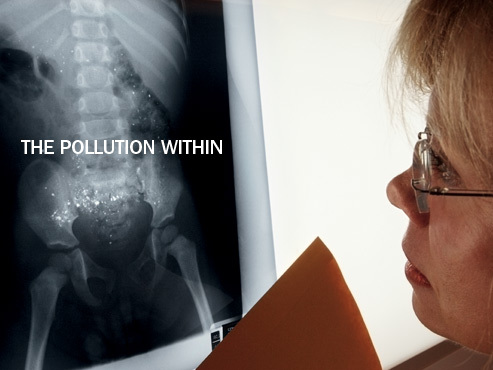 Some of the 209 different PCBs chemically resemble dioxins and cause other mischief in lab animals: reproductive and nervous system damage, as well as developmental problems. By 1976, the toxicity of PCBs was unmistakable; the United States banned them, and GE stopped using them. But until then, GE legally dumped excess PCBs into the Hudson, which swept them all the way downriver to Poughkeepsie, one of eight cities that draw their drinking water from the Hudson. In 1984, a 200-mile (300 kilometers) stretch of the Hudson, from Hudson Falls to New York City, was declared a superfund site, and plans to rid the river of PCBs were set in motion. GE has spent 300 million dollars on the cleanup so far, dredging up and disposing of PCBs in the river sediment under the supervision of the EPA. It is also working to stop the seepage of PCBs into the river from the factories. Birds and other wildlife along the Hudson are thought to have suffered from the pollution, but its impact on humans is less definitive. One study in Hudson River communities found a 20 percent increase in the rate of hospitalization for respiratory diseases, while another, more reassuringly, found no increase in cancer deaths in the contaminated region. But among many of the locals, the fear is palpable. "I grew up a block from the Fort Edward plant," says Dennis Prevost, a retired Army officer and public health advocate, who blames PCBs for the brain cancers that killed his brother at age 46 and a neighbor in her 20s. "The PCBs have migrated under the parking lot and into the community aquifer," which Prevost says was the source of Fort Edward's drinking water until municipal water replaced wells in 1984. Ed Fitzgerald of the State University of New York at Albany, a former staff scientist at the state department of health, is conducting the most thorough study yet of the health effects of PCBs in the area. He says he has explained to Prevost and other residents that the risk from the wells was probably small because PCBs tend to settle to the bottom of an aquifer. Eating contaminated fish caught in the Hudson is a more likely exposure route, he says. I didn't eat much Hudson River fish during my college days in the 1970s, but the drinking water in my dorm could have contained traces of the PCBs pouring into the river far upstream. That may be how I picked up my PCB body burden, which was about average for an American. Or maybe not. "PCBs are everywhere," says Leo Rosales, a local EPA official, "so who knows where you got it." Back home in San Francisco, I encounter a newer generation of industrial chemicals—compounds that are not banned, and, like flame retardants, are increasing year by year in the environment and in my body. Sipping water after a workout, I could be exposing myself to bisphenol A, an ingredient in rigid plastics from water bottles to safety goggles. Bisphenol A causes reproductive system abnormalities in animals. My levels were so low they were undetectable—a rare moment of relief in my toxic odyssey. And that faint lavender scent as I shampoo my hair? Credit it to phthalates, molecules that dissolve fragrances, thicken lotions, and add flexibility to PVC, vinyl, and some intravenous tubes in hospitals. The dashboards of most cars are loaded with phthalates, and so is some plastic food wrap. Heat and wear can release phthalate molecules, and humans swallow them or absorb them through the skin. Because they dissipate after a few minutes to a few hours in the body, most people's levels fluctuate during the day. Like bisphenol A, phthalates disrupt reproductive development in mice. An expert panel convened by the National Toxicology Program recently concluded that although the evidence so far doesn't prove that phthalates pose any risk to people, it does raise "concern," especially about potential effects on infants. "We don't have the data in humans to know if the current levels are safe," says Antonia Calafat, a CDC phthalates expert. I scored higher than the mean in five out of seven phthalates tested. One of them, monomethyl phthalate, came in at 34.8 ppb, in the top 5 percent for Americans. Leo Trasande speculates that some of my phthalate levels were high because I gave my urine sample in the morning, just after I had showered and washed my hair. My inventory of household chemicals also includes perfluorinated acids (PFAs)—tough, chemically resistant compounds that go into making nonstick and stain-resistant coatings. 3M also used them in its Scotchgard protector products until it found that the specific PFA compounds in Scotchgard were escaping into the environment and phased them out. In animals these chemicals damage the liver, affect thyroid hormones, and cause birth defects and perhaps cancer, but not much is known about their toxicity in humans. Long-range pollution left its mark on my results as well: My blood contained low, probably harmless, levels of dioxins, which escape from paper mills, certain chemical plants, and incinerators. In the environment, dioxins settle on soil and in the water, then pass into the food chain. They build up in animal fat, and most people pick them up from meat and dairy products. And then there is mercury, a neurotoxin that can permanently impair memory, learning centers, and behavior. Coal-burning power plants are a major source of mercury, sending it out their stacks into the atmosphere, where it disperses in the wind, falls in rain, and eventually washes into lakes, streams, or oceans. There bacteria transform it into a compound called methylmercury, which moves up the food chain after plankton absorb it from the water and are eaten by small fish. Large predatory fish at the top of the marine food chain, like tuna and swordfish, accumulate the highest concentrations of methylmercury—and pass it on to seafood lovers. For people in northern California, mercury exposure is also a legacy of the gold rush 150 years ago, when miners used quicksilver, or liquid mercury, to separate the gold from other ores in the hodgepodge of mines in the Sierra Nevada. Over the decades, streams and groundwater washed mercury-laden sediment out of the old mine tailings and swept it into San Francisco Bay. I don't eat much fish, and the levels of mercury in my blood were modest. But I wondered what would happen if I gorged on large fish for a meal or two. So one afternoon I bought some halibut and swordfish at a fish market in the old Ferry Building on San Francisco Bay. Both were caught in the ocean just outside the Golden Gate, where they might have picked up mercury from the old mines. That night I ate the halibut with basil and a dash of soy sauce; I downed the swordfish for breakfast with eggs (cooked in my nonstick pan). Twenty-four hours later I had my blood drawn and retested. My level of mercury had more than doubled, from 5 micrograms per liter to a higher-than-recommended 12. Mercury at 70 or 80 micrograms per liter is dangerous for adults, says Leo Trasande, and much lower levels can affect children. "Children have suffered losses in IQ at 5.8 micrograms." He advises me to avoid repeating the gorge experiment. It's a lot harder to dodge the PBDE flame retardants responsible for the most worrisome of my test results. My world—and yours—has become saturated with them since they were introduced about 30 years ago. Scientists have found the compounds planetwide, in polar bears in the Arctic, cormorants in England, and killer whales in the Pacific. Bergman, the Swedish chemist, and his colleagues first called attention to potential health risks in 1998 when they reported an alarming increase in PBDEs in human breast milk, from none in milk preserved in 1972 to an average of four ppb in 1997. The compounds escape from treated plastic and fabrics in dust particles or as gases that cling to dust. People inhale the dust; infants crawling on the floor get an especially high dose. Bergman describes a family, tested in Oakland, California, by the Oakland Tribune, whose two small children had blood levels even higher than mine. When he and his colleagues summed up the test results for six different PBDEs, they found total levels of 390 ppb in the five-year-old girl and 650 ppb—twice my total—in the 18-month-old boy. In 2001, researchers in Sweden fed young mice a PBDE mixture similar to one used in furniture and found that they did poorly on tests of learning, memory, and behavior. Last year, scientists at Berlin's Charité University Medical School reported that pregnant female rats with PBDE levels no higher than mine gave birth to male pups with impaired reproductive health. Linda Birnbaum, an EPA expert on these flame retardants, says that researchers will have to identify many more people with high PBDE exposures, like the Oakland family and me, before they will be able to detect any human effects. Bergman says that in a pregnant woman my levels would be of concern. "Any level above a hundred parts per billion is a risk to newborns," he guesses. No one knows for sure. Any margin of safety may be narrowing. In a review of several studies, Ronald Hites of Indiana University found an exponential rise in people and animals, with the levels doubling every three to five years. Now the CDC is putting a comprehensive study of PBDE levels in the U.S. on a fast track, with results due out late this year. Pirkle, who is running the study, says my seemingly extreme levels may no longer be out of the ordinary. "We'll let you know," he says. Given the stakes, why take a chance on these chemicals? Why not immediately ban them? In 2004, Europe did just that for the penta- and octa-BDEs, which animal tests suggest are the most toxic of the compounds. California will also ban these forms by 2008, and in 2004 Chemtura, an Indiana company that is the only U.S. maker of pentas and octas, agreed to phase them out. Currently, there are no plans to ban the much more prevalent deca-BDEs. They reportedly break down more quickly in the environment and in people, although their breakdown products may include the same old pentas and octas. Nor is it clear that banning a suspect chemical is always the best option. Flaming beds and airplane seats are not an inviting prospect either. The University of Surrey in England recently assessed the risks and benefits of flame retardants in consumer products. The report concluded: "The benefits of many flame retardants in reducing the risk from fire outweigh the risks to human health." Except for some pollutants, after all, every industrial chemical was created for a purpose. Even DDT, the archvillain of Rachel Carson's 1962 classic book Silent Spring, which launched the modern environmental movement, was once hailed as a miracle substance because it killed the mosquitoes that carry malaria, yellow fever, and other scourges. It saved countless lives before it was banned in much of the world because of its toxicity to wildlife. "Chemicals are not all bad," says Scott Phillips, a medical toxicologist in Denver. "While we have seen some cancer rates rise," he says, "we also have seen a doubling of the human life span in the past century." The key is knowing more about these substances, so we are not blindsided by unexpected hazards, says California State Senator Deborah Ortiz, chair of the Senate Health Committee and the author of a bill to monitor chemical exposure. "We benefit from these chemicals, but there are consequences, and we need to understand these consequences much better than we do now." Sarah Brozena of the industry-supported American Chemistry Council thinks safeguards are adequate now, but she concedes: "That's not to say this process was done right in the past." The European Union last year gave initial approval to a measure called REACH—Registration, Evaluation, and Authorization of Chemicals—which would require companies to prove the substances they market or use are safe, or that the benefits outweigh any risks. The bill, which the chemical industry and the U.S. government oppose, would also encourage companies to find safer alternatives to suspect flame retardants, pesticides, solvents, and other chemicals. That would give a boost to the so-called green chemistry movement, a search for alternatives that is already under way in laboratories on both sides of the Atlantic. As unsettling as my journey down chemical lane was, it left out thousands of compounds, among them pesticides, plastics, solvents, and a rocket-fuel ingredient called perchlorate that is polluting groundwater in many regions of the country. Nor was I tested for chemical cocktails—mixtures of chemicals that may do little harm on their own but act together to damage human cells. Mixed together, pesticides, PCBs, phthalates, and others "might have additive effects, or they might be antagonistic," says James Pirkle of the CDC, "or they may do nothing. We don't know." Soon after I receive my results, I show them to my internist, who admits that he too knows little about these chemicals, other than lead and mercury. But he confirms that I am healthy, as far as he can tell. He tells me not to worry. So I'll keep flying, and scrambling my eggs on Teflon, and using that scented shampoo. But I'll never feel quite the same about the chemicals that make life better in so many ways. Subscribe to National Geographic magazine.